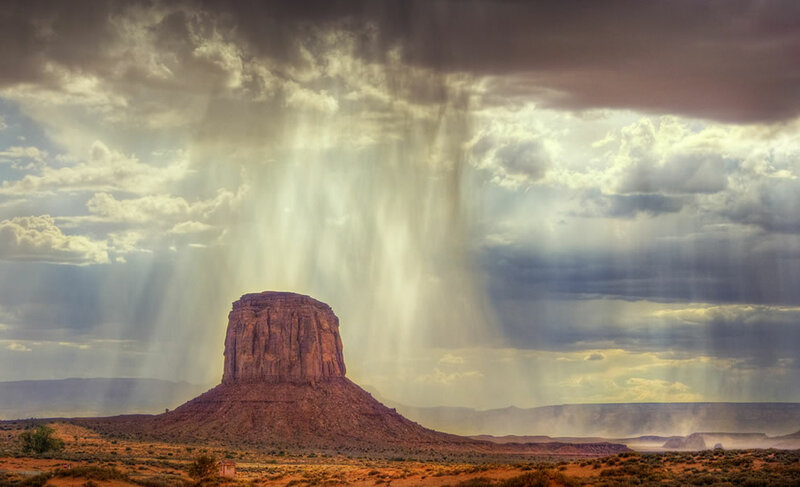 Magnificent Monument Valley is one of the most iconic and enduring landmarks of the American “Wild West.” Monument Valley Navajo Tribal Park has isolated red mesas, buttes and a sprawling, sandy desert that has been photographed and filmed countless times. Crimson mesas and surreal sandstone towers rise hundreds of feet into the air, some as tall as 1,000 feet. The dramatic natural and rich red hues dominate the entire region that spans the border between Arizona and Utah. Both the beauty and the sheer size of the valley provide majestic scenery that overwhelms the senses as the play of sunlight and shadows holds a person spellbound. Monument Valley is not as much a valley as a wide flat plateau, interrupted by crumbling formations that are the last remnants of the sandstone layers that once covered the entire region. This is part two in an ongoing tribute to the Navajo Nation. (Canyon de Chelly National Monument was part one). We love these pics!